What do designers do (II)? This class focussed on design methods. Complementing the earlier class on process, this class looked in more detail at the tools and techniques designers use in their work. In particular we looked at ideation (eg brainstorming, as described by Tom Kelley and researched by Sutton and Hargadon), and the ways designers visualize ideas. Sketches and prototypes function as boundary objects, having an important role in organizations. Different kinds of designers and engineers mean different things by these terms so it's important to understand how these artefacts can be used within the design process, sometimes to open up questions and sometimes to specify design features. We also considered the challenges of creating prototypes of experiences (rather than of products). Finally we considered the service blueprint (or customer journey): a visual narrative of the interactions with touchpoints and staff that a customer goes through within a service, which together impact on his or her experience. Originally proposed by Shostack (1984) in services marketing, this method has been further developed in the practices of service design consultancies. The practical exercise involved groups of MBA students creating a service blueprint/customer journey diagram for parts of an experience we had all shared: air travel. One group tackled check-in (online, kerbside, at a desk); another looked at luggage; another at waiting for the flight; another at the gate; and a fifth group looked at (in-bound) immigration. The value of this design method was clear: creating a visual representation that focussed on the human experience of the service, manifested through engagements with touchpoints or front-stage customer service representatives. The approach contrasts with the sorts of diagrams produced within operations management which tend to focus on flows and efficiency, but pay less attention to usability and desirability. This design method enables the various parts of the organization to come together to look at a visual representation that makes visible the customer experience, but shows how the different functions (marketing, operations, IT, and partner organizations) come together to deliver it - and where the failure points are. If the 20th century was about industrial and product design, this century is likely to be one in which the emerging disciplines of interaction, service and experience design stabilise, and in which the challenges brought about by climate change lead to new ways of doing design. This class introduced students to current thinking and practice. One resource we used was Bill Moggridge's website Designing Interactions, which has short videos featuring some of the leading names involved in the development of human-computer interaction. Things like drop-down menus and the computer mouse - which are now mundane, everyday devices - required a great deal of design effort. Interaction design today is not just about computers and screens but about engagements with objects in which there is embedded, networked intelligence. In service design, the design challenge is how to offer stakeholders a meaningful and consistent experience across different touchpoints arranged in time and space, with the organizational resources aligned to deliver it. 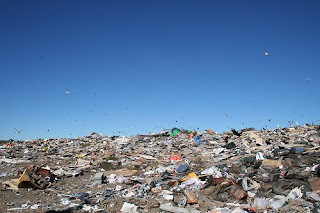 People involved in thinking about the role of design in sustainability have moved from the well-established arguments that we should reduce, re-use and recycle to think of designing products and services that are nutrients (McDonough and Braungart) or attempt to manufacture objects which we can have emotionally durable connections with, so we don't throw them away so quickly (Chapman). Our guest speaker was Chris Downs, co-founder and director of live|work, a service innovation and design consultancy of 26 people with offices in London and Oslo. When Chris did a Google search on "service design" in 2001, there were no search results. His company is one of the leading consultancies in this fast-growing field. Coming from a product design background, Chris talked us through the realizations that got him to the point that he and his co-founders concluded that products don't work economically, environmentally and socially. His company's goal is to enable a shift from products to services which are more financially, socially and environmentally sustainable; to promote use over consumption; and to make more with less. Using examples of services live|work has designed for organizations such as Norwich Union, Experian and the public sector, Chris provided a provocative narrative of the opportunities - and frustrations - of design-led innovation in services. In product manufacturing, the designer's job might well be done once the specification is complete. But service designers have to work closely with the organization to help it turn prototypes and specifications into live services. With their inherent variability, services are harder to standardize, especially if they involve people, which means the design of the service must also involve the design of the service system - so designers (of the customer experience through their engagement with touchpoints) need to work closely with managers and service providers (who need to organize everything required to deliver the touchpoints). Service designers are challenging not just established ideas about the scope of design, but also their clients' understandings about service innovation too. Having considered design as outcome, in this second class we looked at design as process. 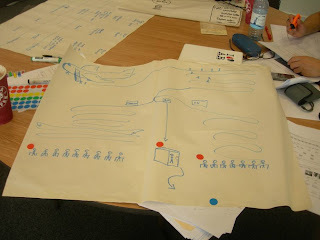 We looked at the situated practices of professional designers, what some people call "design thinking". Picking up some ideas that have become important in theories about design, we considered the idea of wicked problems (Rittel and Webber), which Buchanan has argued are the sorts of problems designers face. To explore this further, Nigel Cross's work on designerly ways of knowing helped show some of the ways that designers frame problems, develop strategies to get to solutions and generate solutions. This was followed by looking at Schon's ideas of reflection in practice and knowing in practice - ways that professionals other than designers go about problem framing and reframing. Other helpful readings included Bill Buxton's Sketching User Experiences with its discussion on the differences between getting the design right and getting the right design. We looked at the idea of convergent and divergent thinking during design processes and the place of ambiguity and uncertainty along the way. The well-known IDEO shopping cart video made by ABC TV provided data for the class to analyse to see what happened in that design process. 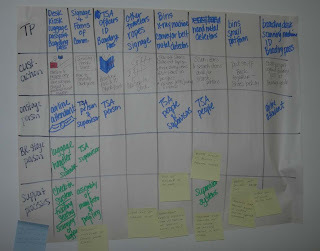 The practical exercises involved taking some of the design problems at the school identified in the previous session, determining criteria for creating a better design outcome and then designing a process to redesign them. This provided useful data to compare and contrast the ways designers frame and solve problems and the ways others do so. One group tackled the sockets problem (see the previous post): they pretty quickly generated a prototype which - which it effectively visualized a solution - illustrated the attachment designers sometimes have to their own ideas, in ways which close down the problem space. What do we mean by design? This first session introduces the MBA students to fundamental ideas about design - what it is, why it matters, and how we make judgements about good or bad design outcomes. Many people feel they want definitions before they start talking about something. 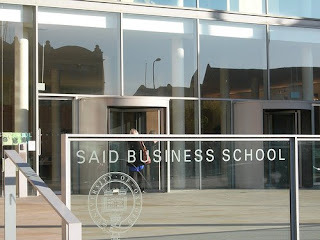 Much of the session was based around a group "crit" (or critique) of designs at Said Business School. The students come from a range of countries, professions and backgrounds - some (on the executive part-time MBA) had just flown in from South Africa and Hawaii. What they all share, however, is the experience of the school, its architecture, its processes and systems, its website and intranet, its marketing collateral and events, its catering, and of course its learning experience. I asked students to bring examples of two things at the school they think are well-designed and two that are badly designed, based on their own criteria. 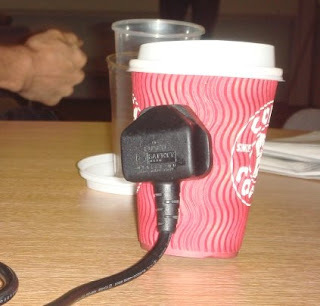 One of the things that came up several times as badly designed was the power sockets built into the floors of the lecture theatres and seminar rooms (pictured). 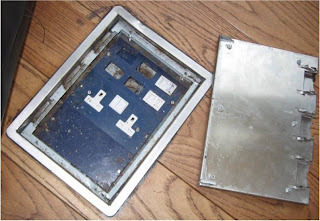 They can present a trip hazard and are hard to clean - and for people like many of our students who are using non-UK adaptors, they are inconvenient to use. Good design examples included the architecture and the new intranet. As examples were presented, this built up the realization of that all the things around us have been designed by someone- not necessarily by a designer ("silent design"). The exercise also emphasized the difficulty of articulating criteria for successful design, and led to a discussion about who is responsible for design in organizations. The architect we can name - but we don't know who designed many of the processes, for example. We went through some of the terminology often associated with design and made the important distinction between design as outcome and design as process. We considered the claim that design is about balancing form and function and updated this with Heskett's terms utility and significance and Krippendorff's calls for a human-centred design that focuses on the meanings created by stakeholders. We also looked at the criteria "useful, usable and desirable" as ways of evaluating design outcomes (from Cagan and Vogel, Creating Breakthrough Products). But Vitruvius' three criteria on which this seems to be based- some two thousand years old - are still robust enough to be used. This class had two main aims - getting students to see the designed artefacts all around us, including the ones that haven't been designed by a professional designer; and developing a critical language that informs the success of design outcomes. Tomorrow we start my MBA elective in Design Leadership, in its third iteration. This year 30 students are taking the class, the majority of whom are from the school's executive MBA, with a few joining from the one-year full time programme. Crammed into just two weeks, the elective aims to give students knowledge, understanding and skills so that they can appreciate the value of design and what some people call 'design thinking' in organizational life and implement these ideas in their own organizations. What I'm calling a manifesto for the class is available here as one-page PDF. "I'm not trying to turn you into designers...but I do want you to become a bit more designerly." Because of the time of year, we are not able to do a joint project with MA students which was a key part of the learning experience in the previous two iterations. Instead, what I have designed into the elective is a number of practical exercises for the students to have a taste of some of the methods designers use. For example students will be creating blueprints of services, developing scenarios, and doing a crit of design of artefacts at the school. We'll even be leaving the safety of the building and venturing out into the streets to look at the idea of 'extreme users' as a design method. In addition we'll be hearing from guest speakers who will share their experiences of managing design in fast-changing organizational contexts: Andrew McGrath, Director of Design and Usability, Orange Global; and Chris Downs, director and co-founder, live|work service design and innovation. Students will also be given opportunities to consider the way design is managed in their own organizations and the issues around organizing for design-led innovation. 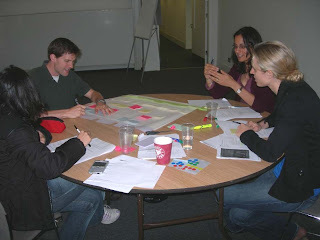 Design and design management are rarely part of the core curriculum on MBA programmes. But given developments at many universities such as at the Rotman School in Toronto, the d-school at Stanford, and at Design London (Imperial College - Tanaka Business School - Royal College of Art) this is beginning to change. What I think is distinctive about our approach is how the elective pays attention academic research in science, technology, and society (STS) and to the importance of students developing their design literacy. So I'll be posting summaries of the class on this blog to contribute to current discussions about the role of design and design thinking in organizations and how these ideas can be taught and learned. Comments from other academics, students and professionals are welcome.